I’ve mentioned before that my husband has gradually taken over our family kitchen, and as he’s done so, he’s developed a bit of a substance abuse problem—a spice-related substance abuse problem. He even has a frequent-buyer card at our neighborhood spice store, so that now when I wrestle through cabinets I may find five or six varieties of curry powder, or at least three bottles of paprika, smoked and otherwise. The spices are taking up an inordinate amount of space in our tiny kitchen; the spice rack on the wall was filled long ago, and we’ve now moved on to valuable cabinet space and <shudder> the top of the fridge. I’ve isolated a small spot on a shelf for baking items like cinnamon, nutmeg, vanilla, and baking soda and powder, but that’s as organized as we are right now. To my mind, anyway. Whatshisname claims he has a system, but now I’m curious about what could possibly be in all of these dozens of bottles. It just bothers me that this much mania exists in my house. So, as I am wont to do, I turned to the experts to help me figure out the proper way spices should be stored. 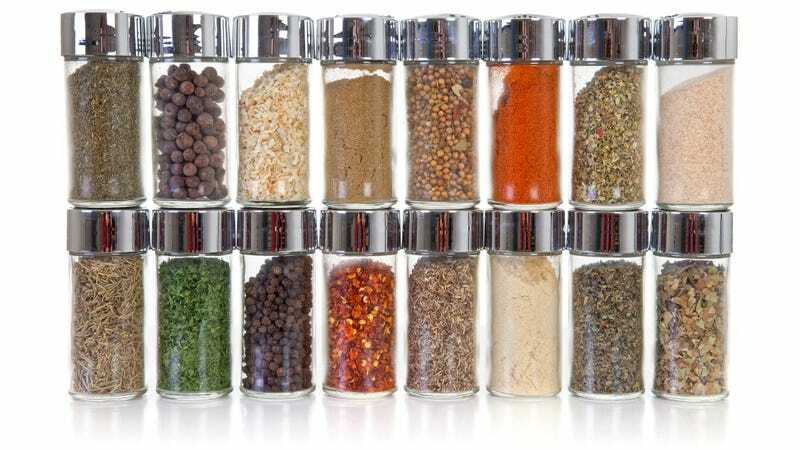 I asked a chef, a professional organizer, and a national spice store chain for their thoughts, and all of their somewhat surprising answers fell into similar pro tip categories. While some experts advise against storing above the stove, due to the increased heat in that area, unfortunately for some of us with limited space, we have to use that prime real estate for spice storage. Label-maker advocate Erin eventually just came over to my house and as she always does, applied method to my madness. The alphabetical spices are now in a three-tiered series of spice steps over the oven. Larger bottles are together, as are salts and peppers, and I still have my baking shelf. Erin is one with her label-maker, so she set up helpful categories for sub-categories like chilis and vinegars. I feel a lot calmer walking into my kitchen now. The trick of course, is to keep it that way. My husband is, let’s say, an artistic domestic chef, so I don’t think he is likely to keep the turmeric next to the thyme. I suspect that things will play out where the things he uses most often will be in easiest reach, maybe on the front tier of that spice shelf, with the rest alphabetical (hopefully) behind. And as long as we can keep his frequent spice shop purchases to a manageable level, we should at least be able to keep our spice collection in cabinets and away from the terrifying trenches of the top of the refrigerator.